Children are never too young (or too old) to take action. If heart disease or stroke runs in your family, there's one thing that's just as important as taking care of yourself—taking care of your children. You may already have been diagnosed with heart disease or had a heart attack or stroke. It's possible you also have a condition such as high blood pressure, high cholesterol, or diabetes that raises your risk for a heart condition. If your siblings, parents, or grandparents are in the same boat, it's a good bet you have what's known as a family history of heart disease. And so do your kids. Whether they are children, teens, young adults, or adults, they need to know, says Dr. Paula A. Johnson, professor of cardiology and head of women's health at Harvard-affiliated Brigham and Women's Hospital. "Knowing your family history is one of most powerful tools we have to guide how we take care of ourselves from a health perspective," Dr. Johnson says. This is a chance for your children to make changes that will have both immediate and long-term payoffs. The biggest warning signs are early problems with the heart or blood vessels. "Early" here means before age 55 for men and before age 65 for women. Because estrogen has a heart-protective effect, Dr. Johnson says, very early heart trouble in women is a strong sign of a predisposing family history. Having a family history of heart disease is not trivial. In a study of over 122,000 Utah families, 14% had a history of heart disease. But members of these families made up 72% of people who had early heart disease, 48% of people with heart disease at any age, and 86% of people who had strokes before age 75. Genes passed from one generation to the next affect all the biochemical factors that influence heart disease: how well your body controls dietary fats, how your body recognizes and deals with infections, blood vessel function, blood clotting, insulin sensitivity, blood pressure control, and more. Genes, however, are not the whole story. Families often share the same diet, have the same attitude toward physical activity, live in the same area, and belong to the same culture. All these factors may also influence risk of heart disease and stroke. In other words, genes are not destiny. Whatever your family history, your personal health decisions matter most. Your family history does not doom your children to heart disease. Prevention—through diet, lifestyle, and health care—makes a huge difference. In the Utah study, there was a lower incidence of heart disease in a later generation that was issued a warning about its family history. What to tell your children depends on their age. If they haven't yet reached young adulthood, it's more important to reassure them than to scare them. For younger children, don't give too much information too quickly. Start with some simple facts, and ask if they have any questions. Answer simply and directly. "Say 'we have cardiovascular disease in our family,' and explain what that is. And really point out the fact that we can prevent these problems," Dr. Johnson advises. "Talk to children about healthy eating and exercising." A model of the heart may help you explain heart disease to young children. Referring to the heart as a pump, and to the blood vessels as plumbing, may help them visualize basic ideas. If your kids—or even your grandkids—already have reached adulthood, don't assume they know about their family risk. "Many young people do not have regular medical care, so those with a family history of heart disease must understand why it is important to have a relationship with a primary care physician," Dr. Johnson says. "With the advent of health care reform, this is an opportune time for them to be getting into the health care system, understanding what their family histories are, and learning what they can do to maintain their health." Depending on the kinds of heart disease that run in a family, certain tests may be important. For example, some families are predisposed to very high cholesterol levels, a genetic trait called familial hypercholesterolemia. Early high blood pressure or heart valve problems may require other kinds of tests. "Talking with children about family history of heart disease is much more about discussing opportunities for prevention, and whether any kind of testing is necessary," Dr. Johnson says. "It isn't something that should get people worried or anxious. But they should take note." 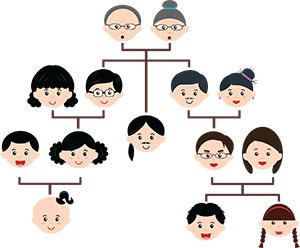 The best way to learn about your family history is to ask questions. Talk at family gatherings and record your family's health information—it could make a difference in your child's life. Record the names of close relatives from both sides of the family: parents, siblings, grandparents, children, aunts, uncles, nieces, and nephews. Include conditions each relative has (or had) and at what age the conditions were first diagnosed. Discuss family health history concerns with your child's doctor, and with the mother's doctor if the family is considering having another child. Gather this information before seeing the doctor. Update family health history regularly. If your child is young, share that information with his or her doctors. Older children should share the updates with their physicians.